1- Within a comment under our Arabic article titled "On the Ordeal of Changing Oneself to the Better" found (in English) on this link: (http://www.ahl-alquran.com/English/show_article.php?main_id=16764), our Quranist brother Saeed Ali has written a comment titled "we are to offer many thanks to the former head of Al-Azhar Dr. Abdel-Haleem Mahmoud", and we quote his entire comment here: (Dr. A. S. Mansour, who was an assistant professor at the time at Al-Azhar University, has submitted his PhD thesis in 1977, and Dr. Mahmoud died in 1978. 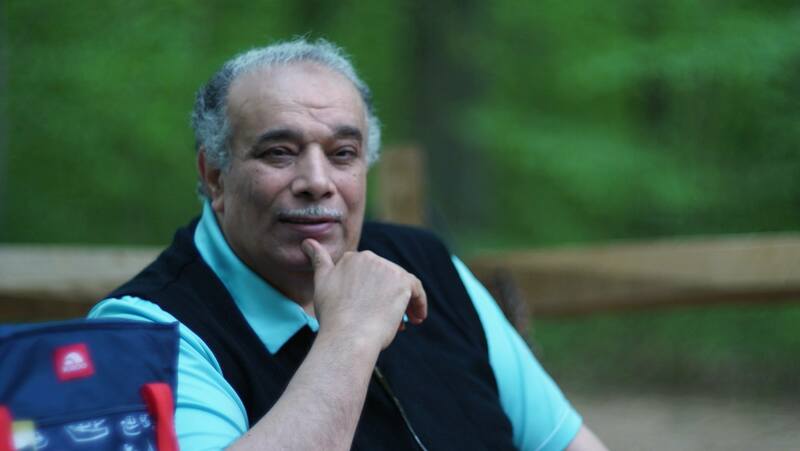 In a life-altering moment and a decisive time in the life of Dr. Mansour, he has decided not to acquiesce; he insisted on submitting the thesis and obtaining his degree based on Quranic facts. Such a glorious moment would not have come into being if it had not been for using his reasoning mind to measure all possibilities and consequences, guided only by the Quran. Thus, real success is born out of suffering and burdens. Such severe ordeals established firmly his mentality that never cedes or surrenders, and never buy the transient world glory by selling one's place in the Hereafter. This is why all readers feel the veracity and sincerity in all writings of Dr. Mansour, derived from suffering many ordeals. We are thankful for to the Sufi head of Al-Azhar Dr. Mahmoud who inadvertently inflamed the light of Quranist enlightenment, though he was bent on extinguishing it! such torch of Quranism is still illuminating the darkness of so many people until now, exposing an debunking many myths. Such enlightenment began first by suffering many ordeals, with the glimmering hope of reform and change to take place soon. With each new article by Dr. Mansour, readers feel that his life experiences are formulating now great ideas and pieces of advice from a caring, loving father to all his Quranists daughters and sons worldwide. May God grant him and them excellent health and more Quranist ponderings that will fill the website. We, Quranists, are engaged into peaceful intellectual jihad using the Quran, the great book that we research in the methodology clarified by Dr. Mansour based on and derived from the Quran itself. God bless Dr. Mansour and all our brethren the Quranists.). 2- May God bless and reward Mr. Saeed Ali; we thank him a lot for his comment; his words have reminded us of a Quranic rule mentioned in two verses in the Quranic text, and it is directly linked to our topic here. This rule is mentioned first in this verse: "...Were it not for God's restraining people by means of others, the earth would have gone to ruin. But God is gracious towards humankind." (2:251); the context here is a comment about a story related to the Israelites. And this rule is mentioned for the second time in this verse: "...Were it not for God's restraining people by means of others, monasteries, churches, synagogues, and mosques - where the name of God is mentioned much - would have been demolished. God supports whoever supports Him. God is Strong and Mighty." (22:40); the context here is about legislations of self-defense fighting in Islam. Let us examine below in detail the Quranic contexts of 2:251 & 22:40. Firstly: within a story related to the Israelites: "And they defeated them by God's leave, and David killed Goliath, and God gave him sovereignty and wisdom, and taught him as He willed .Were it not for God's restraining people by means of others, the earth would have gone to ruin. But God is gracious towards humankind." (2:251); let us briefly trace the story from its very beginning. 1- God saved the Israelites and caused Moses' Pharaoh to drown along with his regime, soldiers, retinue members, etc., and God made the Israelites temporarily inherit the rule of Egypt with all its people and its treasures and fertile lands; it was natural that people would destroy all buildings and palaces of Moses' Pharaoh: "So We took vengeance on them, and drowned them in the sea-because they rejected Our signs, and paid no heed to them. And We made the oppressed people inherit the eastern and western parts of the land, which We had blessed. Thus the fair promise of your Lord to the Israelites was fulfilled, because of their endurance. And We destroyed what Pharaoh and his people had built, and what they had harvested." (7:136-137); "So We drove them out of gardens and springs. And treasures and noble dwellings. So it was. And We made the Israelites inherit them." (26:57-59). 2- God's divine intervention caused the tyrannical pharaoh to die and his regime and retinue member to be destroyed; the weak parties (i.e., the Israelites) ruled Egyptian land for a while as rulers/kings until God commanded them to leave Egypt to enter the holy land (i.e., Palestine) promised to them; God made Moses remind the Israelites of God's bounties granted to them: "When Moses said to his people, "O my people, remember God's blessings upon you, when He placed prophets among you, and made you kings, and gave you what He never gave any other people."" (5:20). God has commanded them to enter Palestine while warning them against disobedience: ""O my people, enter the Holy Land which God has assigned for you, and do not turn back, lest you return as losers."" (5:21); yet, the Israelites refused out of fear: "They said, "O Moses, there are tyrannical people in it; we will not enter it until they leave it. If they leave it, we will be entering."" (5:22). Two good men among real believers suggested this: "Two men of those who feared, but whom God had blessed, said, "Go at them by the gate; and when you have entered it, you will prevail. And put your trust in God, if you are believers."" (5:23); yet, the Israelites refused again: "They said, "O Moses, we will not enter it, ever, as long as they are in it. So go ahead, you and your Lord, and fight. We are staying right here."" (5:24). Moses invoked God Who punished them by wandering for 40 years: "He said, "My Lord! I have control only over myself and my brother, so separate between us and between the wicked people. He said, "It is forbidden for them for forty years. They will wander aimlessly in the land. So do not grieve over the wicked people."" (5:25-26). 3- This means that at the time, the Israelites were used to submissiveness and reluctance to exert any endeavors because they suffered for decades from Pharaonic tyranny and then they ruled Egypt for a while without any efforts at all on their part; even during exodus, God granted them clouds as shields against the heat of the sun, wells of water, and quails and manna; see 2:57 and 2:60-61; yet, the longed for the Egyptian Koshary (food of the poor) whose ingredients are mentioned in the verse 2:61. Hence, it was expected that they would be reluctant to enter Palestine or the holy land; thus, the punishment of wandering in the deserts was inflicted upon them by God for 40 years so as to let the submissive, reluctant generations die and a new generation would emerge that can struggle and execute God's commands. 4- We infer from the verse 28:48 that during the 40-year of wandering the deserts, Moses and Aaron led the Israelites at one point to Mecca, where Qorayish lived and where God's House, the Kaaba, is situated, built by patriarch Abraham. Moses preached Qorayish to believe in the monotheism of the testimony (There is no God but Allah), and they were made to see miracles (e.g., of the staff of Moses), but the Qorayish men rejected the call of Moses and accused him and Aaron of being sorcerers. 5- After the death of Moses, we read in the Quran that another generation entered Palestine and that in later decades, aggressive ones attacked Palestine and drove the Israelites out of their homes and enslaved their children. The main figures among the Israelites gathered and asked their prophet to appoint a king for them so that this king would lead them in their self-defense fighting; this prophet reminded them of the former reluctance, but they declared their intention to fight to resist forced displacement and enslavement of their children: "Have you not considered the notables of the Children of Israel after Moses? When they said to a prophet of theirs, "Appoint a king for us, and we will fight in the cause of God." He said, "Is it possible that, if fighting was ordained for you, you would not fight?" They said, "Why would we not fight in the cause of God, when we were driven out of our homes, along with our children?" But when fighting was ordained for them, they turned away, except for a few of them. But God is aware of the wrongdoers." (2:246). This prophet, whose name is not mentioned in the Quran, was convinced of their will to fight the aggressive enemy, and God told him to choose Talut as their king, and the Israelites did not like the fact that this ordinary poor man would be appointed king; this prophet refuted their stance and God gave them a miraculous sign to assert the choice of Talut as king: "Their prophet said to them, "God has appointed Talut to be your king." They said, "How can he have authority over us, when we are more worthy of authority than he, and he was not given plenty of wealth?" He said, "God has chosen him over you, and has increased him in knowledge and stature." God bestows His sovereignty upon whomever He wills. God is Embracing and Knowing. And their prophet said to them, "The proof of his kingship is that the Ark will be restored to you, bringing tranquility from your Lord, and relics left by the family of Moses and the family of Aaron. It will be carried by the angels. In that is a sign for you, if you are believers."" (2:247-248). 6- In the ordeal/test of changing themselves to the better, from being submissive to aggressors to persevere, confront, resist, and ward off the aggressive unjust disbelieving enemies, Talut made a test to sift the Israelites to know the real pious ones, who were fewer in number but God lent them victory as they were really pious believers who adhered to patience; among this fewer number of them was David who killed Goliath and later on became a prophet and a king: "When Talut set out with the troops, he said, "God will be testing you with a river. Whoever drinks from it does not belong with me. But whoever does not drink from it, does belong with me, except for whoever scoops up a little with his hand." But they drank from it, except for a few of them. Then, when he crossed it, he and those who believed with him, they said, "We have no strength to face Goliath and his troops today." But those who knew that they would meet God said, "How many a small group has defeated a large group by God's will. God is with the patient ones." And when they confronted Goliath and his troops, they said, "Our Lord, pour down patience on us, and strengthen our foothold, and support us against the faithless people. "And they defeated them by God's leave, and David killed Goliath, and God gave him sovereignty and wisdom, and taught him as He willed..." (2:249-251). 7- After all that, the Quranic celestial rule of God comes in this verse: "...Were it not for God's restraining people by means of others, the earth would have gone to ruin. But God is gracious towards humankind." (2:251). 1- The Qorayish tribe drove Muhammad and early believers with him out of Mecca, forcing them to leave their homes and possessions; they had to immigrate to Yathreb. The Qorayish tribes attacked Yathreb with its military troops; at first, Muhammad and early believers were commanded to never resist or fight back, until they were physically, psychologically, and militarily ready for self-defense fighting. Verses with legislations of self-defense fighting were later on revealed; fighting must NEVER be aggressive but only for the sake of self-defense; this is the meaning of military jihad for God's sake, and NOT for the sake of transient possessions of the world: "And fight in the cause of God those who fight you, but do not commit aggression; God does not love the aggressors." (2:190); "The sacred month for the sacred month; and sacrilege calls for retaliation. Whoever commits aggression against you, retaliate against him in the same measure as he has committed against you. And be conscious of God, and know that God is with the righteous." (2:194); self-defense fighting goes on since aggressors go on with their violence and aggressions, and it tops when aggressions stops: "But if they cease, then God is Forgiving and Merciful......But if they cease, then let there be no hostility except against the aggressors." (2:192-193). The legislative higher purpose of the legislations of self-defense fighting is to guarantee and impose religious freedom and to stop fitna (i.e., religious persecution); thus, one's religion becomes only God's so that He will judge it on the Last Day. Religion is God's and homeland is for all citizens living in it: "And fight them until there is no religious persecution, and worship becomes devoted to God alone. But if they cease, then let there be no hostility except against the aggressors." (2:193); "Fight them until there is no more religious persecution, and religion becomes exclusively for God. But if they desist - God is Seeing of what they do." (8:39). Therefore, to stop all forms of compulsion and coercion in religion is a legislative rule in Islam/the Quran; see 2:256 and 1:99. When enemies tend toward peace, so be it and we are to let peace prevails, even if the enemy is deceiving us; see 8:61-62. 2- Yet, most of the early believers got used to submission an surrender and desired not to resist the evil and aggression of Qorayish; they hated self-defense fighting though it was good for them and sought to postpone it. "Fighting is ordained for you, even though you dislike it. But it may be that you dislike something while it is good for you, and it may be that you like something while it is bad for you. God knows, and you do not know." (2:216); "Have you not considered those who were told, "Restrain your hands, and perform your prayers, and spend in regular charity"? But when fighting was ordained for them, a faction of them feared the people as God is ought to be feared, or even more. And they said, "Our Lord, why did You ordain fighting for us? If only You would postpone it for us for a short while." Say, "The enjoyments of this life are brief, but the Hereafter is better for the righteous, and you will not be wronged one bit."" (4:77). 3- In the ordeal/test of changing themselves to the better, from being submissive to aggressors to persevere, confront, resist, and ward off the aggressive unjust disbelieving enemies, God has urged them to engage into self-defense fighting though their number was less than that of the enemies troops: "O prophet! Rouse the believers to battle. If there are twenty steadfast among you, they will defeat two hundred; and if there are a hundred of you, they will defeat a thousand of those who disbelieve; because they are a people who do not understand. God has now lightened your burden, knowing that there is weakness in you. If there are a hundred steadfast among you, they will defeat two hundred; and if there are a thousand of you, they will defeat two thousand by God's leave. God is with the patient ones." (8:65-66); God has said to Muhammad: "So fight in the cause of God; you are responsible only for yourself. And rouse the believers. Perhaps God will restrain the might of those who disbelieve. God is Stronger in Might, and More Punishing." (4:84). 4- This is the Quranic context of 22:40, "God defends those who believe. God does not love any treacherous disbelievers. Permission is given to those who are fought against, and God is Able to give them victory. Those who were unjustly evicted from their homes, merely for saying, "Our Lord is God." Were it not for God's restraining people by means of others, monasteries, churches, synagogues, and mosques - where the name of God is mentioned much - would have been demolished. God supports whoever supports Him. God is Strong and Mighty." (22:38-40). God guarantees to defend believers/peaceful ones as He hates aggressors, and He permits self-defense fighting to resist aggression and guarantees to lend victory to the wronged parties; this permission of self-defense fighting is linked to the justification of the wronged ones being driven out of their homes and possession as they were religiously persecuted because they worshipped only God without worshipping deities of the polytheists. 5- The legislative higher purpose of the legislations of self-defense fighting is to guarantee religious freedom and performance of all rituals freely in all houses of worship owned by all denominations; this is the reason for God's restraining people by means of others: "...Were it not for God's restraining people by means of others, monasteries, churches, synagogues, and mosques - where the name of God is mentioned much - would have been demolished. God supports whoever supports Him. God is Strong and Mighty." (22:40). 1- Religious freedom is the basis for the political freedom. The dominance of the religious obscurantist clergy in a given society is directly linked to political tyranny; tyrants form an alliance with their clergy to dominate and control citizens. 2- Advanced strong countries on Earth are those which guarantees absolute religious freedom for all citizens; this applies to Israel in all is laws and practices, where Jews, Muslims, Christians, Baha'is, and other people of all denominations live in peace and security. By the way an Israeli president has been imprisoned and the verdict has been issued by a judge who is a Muslim Israeli citizen. 3- The Israeli state security apparatuses specialize in protecting the Israeli citizens, not in oppressing and torturing them. The Israeli military is victorious in all its battles since 1948 till now, and no emergency law was ever imposed inside Israel. The Israeli soldiers are loyal in defending their country because it is theirs, not owned by tyrants. Israel cares for its soldiers during their lifetimes and after they die; they must retrieve the corpses to be buried in their homeland with dignity. 4- The Egyptian military is the strongest of all Arab armies – it was defeated in 1948 and Israel has been established as a result, and it was defeated in 1965, and president Nasser has ceded the Sinai village Um Al-Rehash (now called Eilat) to Israel, giving Israel the chance to invade Sinai in 1967 while defeating the Egyptian military; another defeat of the Egyptian military by Israel is in 1973, as we infer from the Camp David Accords. 5- We tend to think that the Egyptian military never achieves victory, on a daily basis, except over the Egyptian citizens, since the 1952 coup d'état, since president Nasser opened the military prison to torture Egyptian civilians, and since president Sadat turned Egypt into a battlefield for the Egyptian military after his peace accords with Israel. Thus the enemy of the Egyptian military is the Egyptian nation; now, Egypt sank into lower depths of the abyss as president Al-Sisi has ceded the two Red Sea islands, Tiran and Sanafir, to the cursed KSA! 6- By the way, does this verse: "...How many a small group has defeated a large group by God's will. God is with the patient ones." (2:249) apply to Arabs/Muhammadans or to Israel? We tend to think that it applies to the former, of course. 1- Within God's restraining people by means of others, Quranists have emerged as a positive reaction, with persistence and perseverance to refute Wahabism and to expose the alliance between political tyranny and obscurantist religious clergy. 2- We hope that this Quranic verse applies to Quranists: "... God supports whoever supports Him. God is Strong and Mighty." (22:40).